Awards fueled by public support for nonprofits meeting the needs of veterans and active-duty service members. Leaders from Regions Bank present a $5,000 grant to the nonprofit Three Hots and a Cot in metro Birmingham, Ala., on Dec. 6, 2018. 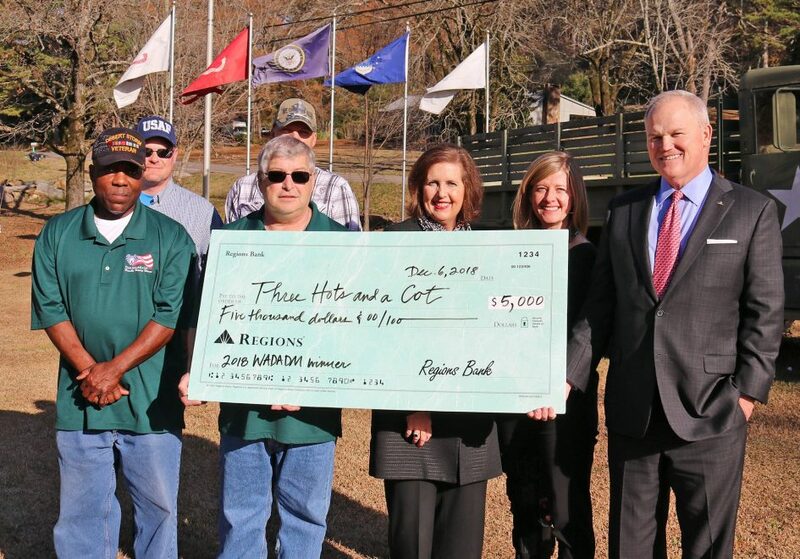 BIRMINGHAM, Ala. – Dec. 6, 2018 – Veterans will have upgraded living facilities. More volunteers will give their time and talents to honor service members. And, already, more people are aware of nonprofits delivering essential services for those who helped protect America’s freedom. 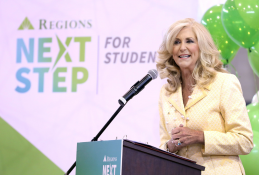 Those are some of the benefits of What a Difference a Day Makes, a volunteerism and grant award program Regions Bank developed to support nonprofits – while including the public in the process as well. During November, What a Difference a Day Makes focused on nonprofits devoted to military veterans and active-duty service members. 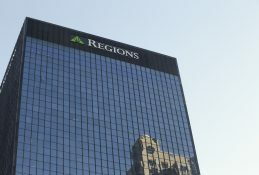 Regions shared the stories of several nonprofits across the Southeast and Midwest on the company’s news website, regions.doingmoretoday.com, as well as through the bank’s social media. Online visitors could learn about each nonprofit and its mission – and then vote for their favorite organization once per day. 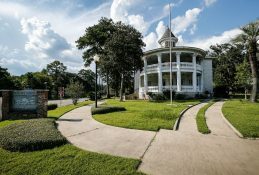 Three Hots and a Cot of Birmingham received more votes than any other nonprofit participating in the November campaign. The organization’s primary mission is to help homeless veterans transition from life on the streets into a self-sustained lifestyle. 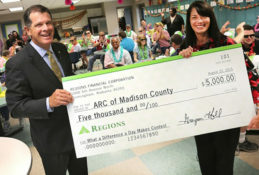 Based on its 32,517 votes, Three Hots and a Cot received a $5,000 check presentation from Regions Thursday and will receive 100 hours of volunteer service from Regions associates. Operation Stand Down Tennessee in Nashville finished second with 27,006 votes and will receive a $2,500 donation from Regions along with 50 hours of volunteer service. H.E.R.O.E.S. Care, based in St. Louis, Mo., will receive a $1,500 donation and 50 hours of volunteer service for finishing third with 5,298 votes. Further, the Hoosier Veterans Assistance Foundation in Indianapolis, which received 3,082 votes will receive a $1,000 grant as well as 50 hours of volunteer service. All other nonprofits that participated will receive grants from Regions of $500, along with 50 hours of volunteer service. Collectively, over 71,000 votes were cast between 11 nonprofits participating in the November program. While donations are important, Keith Herron, head of Corporate Responsibility and Community Engagement for Regions, pointed to the longer-term impact of the program as well. Rich Cislak, Chief Financial Officer of Three Hots and Cot said the awareness, funding and volunteer support generated by What a Difference a Day Makes will significantly impact the organization. Volunteerism from Regions associates is expected to largely focus on financial education for veterans served by Three Hots and a Cot. 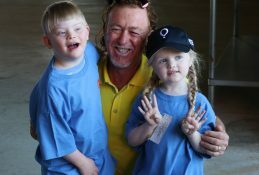 The online contest is one component of Regions’ ongoing What a Difference a Day Makes program, which is celebrating its 11th anniversary this year. As part of the program, Regions gives each of its associates a paid day off every year to volunteer for nonprofits of their choice. What a Difference a Day Makes also complements Regions’ comprehensive approach to community support. Further information about the company’s charitable contributions, community reinvestment activities and other programs, can be found at this link. Public encouraged to join by casting votes and sharing stories through social media. Regions recognizes 16 nonprofits for their hard work throughout the month of November. 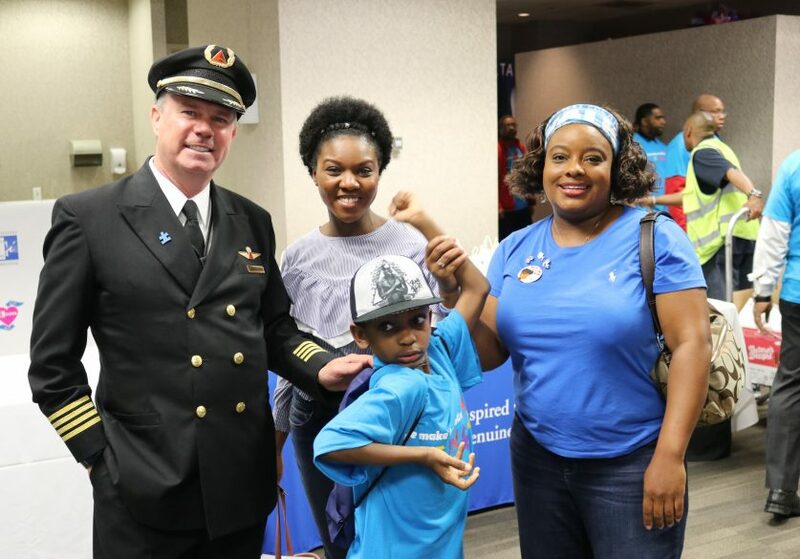 Regions’ support of Wings for All helps people with disabilities and their families prepare to fly.